As we reported back in September, Ricky Gervais and Stephen Merchant are calling it quits for Extras after only two seasons. Though the BBC2/HBO series is very popular and quite funny, the duo have decided to move on to something else. Is there any chance we’ll get a little bit more of Extras? Extras is a British series that revolves around the crazy world of show business and an aspiring actor named Andy Millman (played by Ricky Gervais). Andy struggles to find acting work but keeps losing out on roles — to famous stars no less. Series guests have included Patrick Stewart (X-Men), Kate Winslet (The Holiday), Daniel Radcliffe (Harry Potter films), Orlando Bloom (Pirates of the Caribbean films) and Ben Stiller (upcoming Hardy Men). 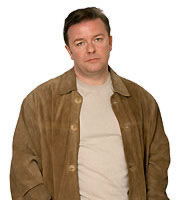 The series is said to somewhat parallel Gervais’ personal career struggles prior to The Office. While the duo won’t be producing a third season of Extras, they aren’t done with the series just yet. As they did with The Office, the duo intend to end Extras with a one-time finale special. There are no firm dates or castmembers as yet. The special is in the very early stages of development but its nice to know we haven’t seen the last of Andy Millman. I’m sure he’ll be popping up in a film some time soon — or at least trying to. 🙁 I really wanted to see a season 3 of Extras. The only reason I kept HBO after the Sopranos went off the air was to keep watching reruns of Extras. I really like Ricky Gervais and want to see more of him.